sola scriptura (Scripture alone) – read less books ABOUT the Bible and read the Bible more. Monday is Reformation Day. In my post yesterday, there were two foundational teachings mentioned. Today I want to take a look at one: sola scriptura (Scripture alone). I do not want to retell history, rather, I want to apply it to today, hence the title of this post. 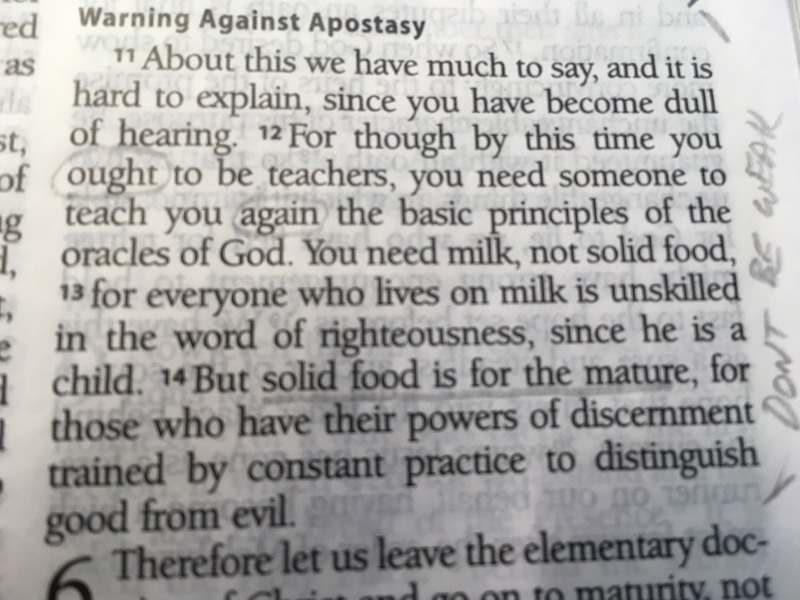 To rely on the teachings of people about the Bible rather that getting into the Bible and learning how to learn from it is like asking someone else to chew your food for you and spoon it in your mouth. Disgusting, right? Read your Bible. Every day. No. Matter. What. As you read it, more and more, it will begin to make more and more sense. You can then go to people who know more than you and ask questions based on your reading. They should be able to help you find other Scriptures that explain the answers to those questions. Scripture is it’s own best interpreter. Don’t know how to begin? It’s ambitious, but worth it. Too much for you? Try these two instead to start. Secondly, be sure you’re in a church that actually preaches and teaches the Bible. Not one where the preacher uses the Bible to promote the latest agenda or program. If they don’t actually preach the Bible, talk to them about it. Ask why. Engage in a conversation about the importance of getting our teaching from the Scripture more that those who talk about it, or worse, from culture. Finally, do you have anyone in your life asking you about your Bible reading? Do you have any accountability in this area? No? Find some. Enter into a fellow disciple conversation that is Scripture centered, regular, and honest.